I can't quite recall exactly when I first watched 'Uncle Atom's' youtube videos. I'm certain it was when I first started to get back in to this hobby and searched for general painting tips, somehow ran across his videos and followed his channel ever since. I regularly save his 2 hour Every Other Sunday chats as background while I hobby late at night. They're chill and informative.He mentioned Tabletop Minions Expo (TMX) last year, which Tim and Josh attended, but despite my own interest, my work schedule didn't allow. Adam had another go at it this year, and...by the grace of anthropomorphized fate, I was free to go! Overall, it was a good time trying out a demo or two, running a couple of game demos myself, and shootin' the talk with fellow minions. 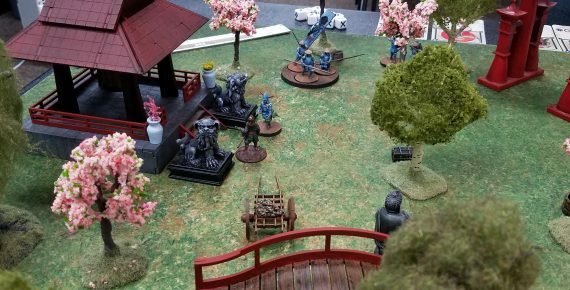 It's a much smaller event than something like Adepticon or Polar Vortex; perhaps more of a gathering, being in it's early stages. 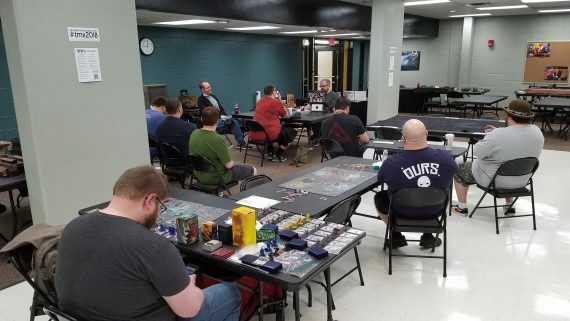 But it's also very friendly and populated by people passionate about and interested in the hobby. Here are some of the events witnessed at TMX '18. Welcome! 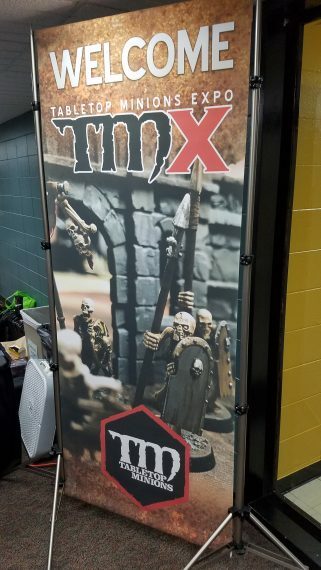 Nice banner, with some classic skellies. 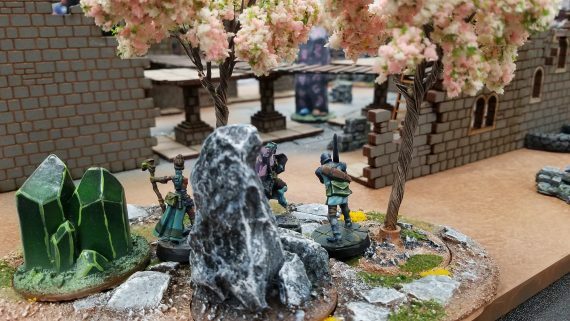 Matt made an appearance with some Wreck Age demos on a really slick demo table with a good selection of minis available. Simply for participating he offered a free mini from a pile. Check out their 2e rules! Seriously, I dig this board! It's got some great detailing but retains a flat utility for gameplay. Great job guys! 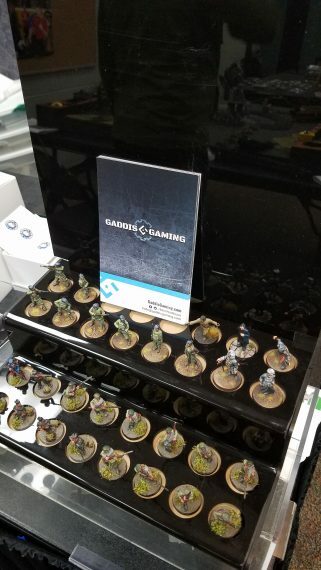 Lee Gaddis from Gaddis Gaming was there promoting a few items including his "Weird WWI" Shattered Crown game. I haven't played this yet, but have heard some positive things and look forward to trying it soon! Plus, Lee is great fun to hang with. 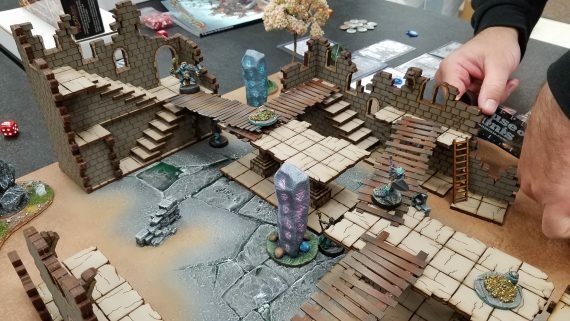 One of Gaddis' larger products include a somewhat modular tabletopper. 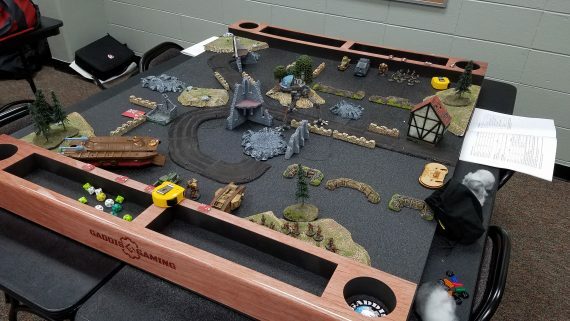 It's made out of a lightweight, portable foam, with some side panels for holding drinks, dice, templates, etc. 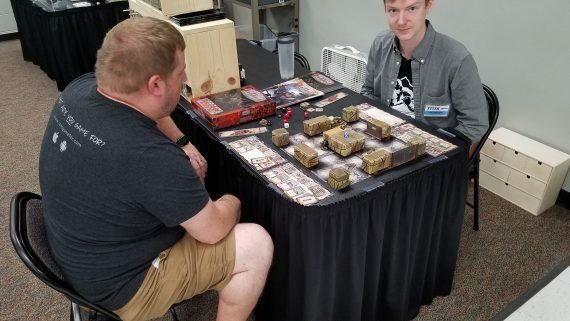 Nick and Hal were there promoting their game, Broken Contract, along with a new version which expands upon the battlefield some more. Always a cool little setup, and some really nice people behind this project. Shadespire! 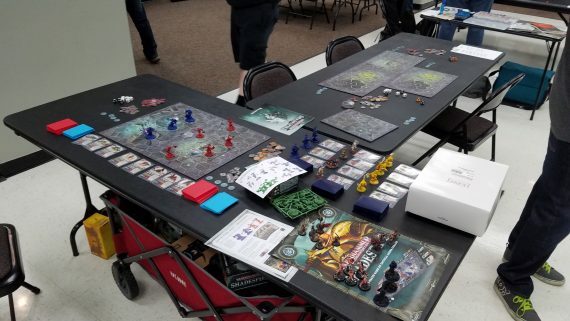 A larger setup, for doing multiple demos or 4 player games. This was a pretty nice setup, I believe all available factions were present. 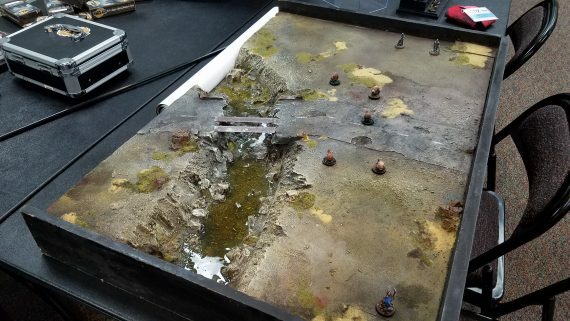 I didn't get a chance to try this due to some time constraints, but I heard some good comments and many of the people I chatted with already play. Definitely popular. 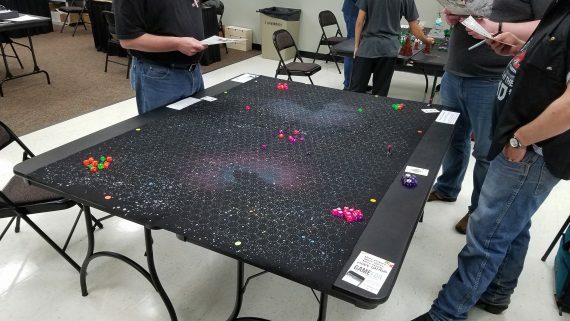 Someone ran a spaceship combat game called "Silent Death". Seemed pretty expansive, but I'm sad to admit I didn't get much info on this game. 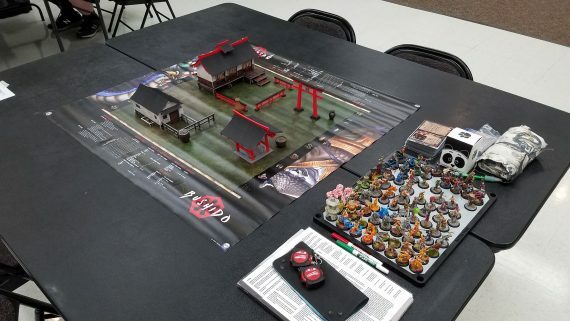 Another good fellow, Christopher, ran Bushido demos on this cool little setup. 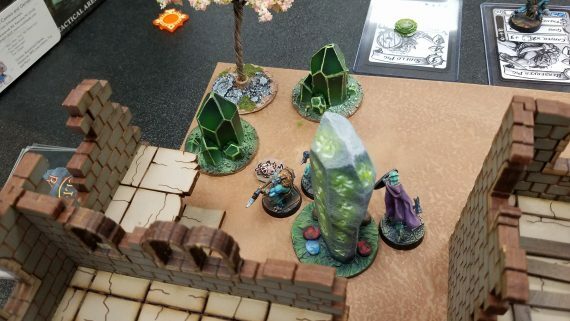 Clearly he's passionate about the game, and had MANY wonderfully painted minis. His freehand tattoo work was fantastic! 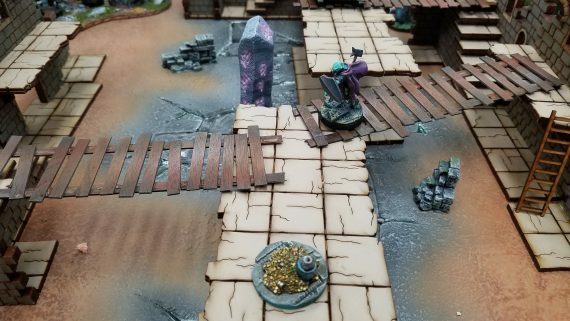 A favorite, Gaslands made an appearance a few times over the two days. The participants really seemed to enjoy themselves. 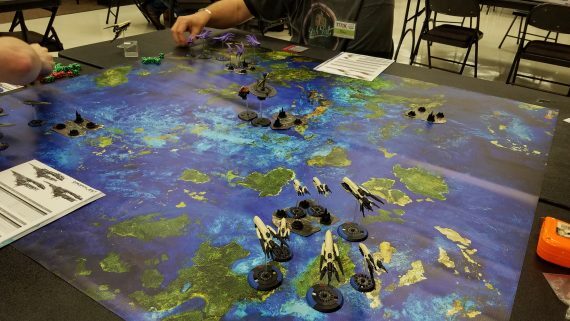 I jumped in to a trial game of Dropfleet Commander, the orbital fleet version of DropZone Commander. 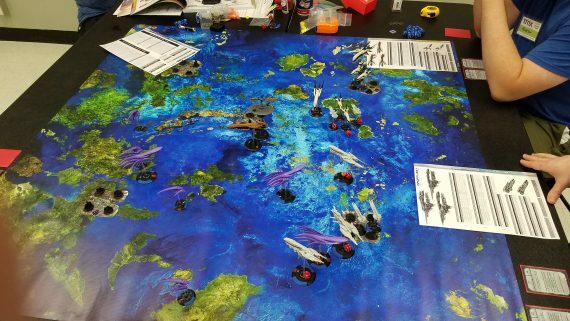 Pretty interesting ship combat game, with some very flavorful models, and distinct between factions. Quite a few charts to reference, but the gameplay itself wasn't overly complex. I had to drop out of my game due to time limitations for running my own demos, but luckily someone was admiring in the crowd and wanted to jump in. Looked like some pretty chaotic battles ensued! 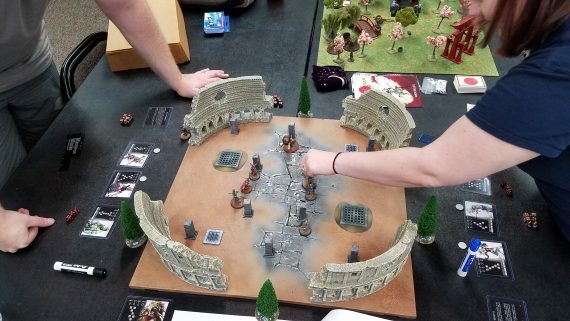 I ran a demo favorite, Arena Rex. 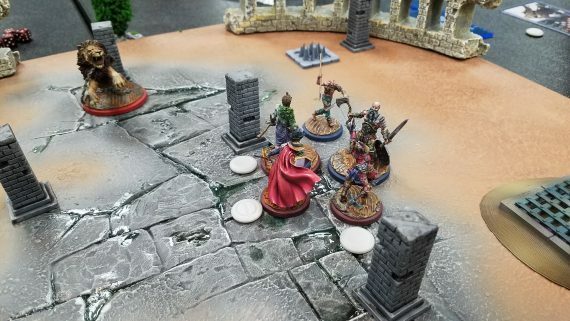 This bloodlusty couple seemed to enjoy slaughtering each other, and the game had a great turnaround moment just as one participant thought he was doomed! For glory in the arena! I believe this was right after someone got kicked in to the pit trap! Lethal! 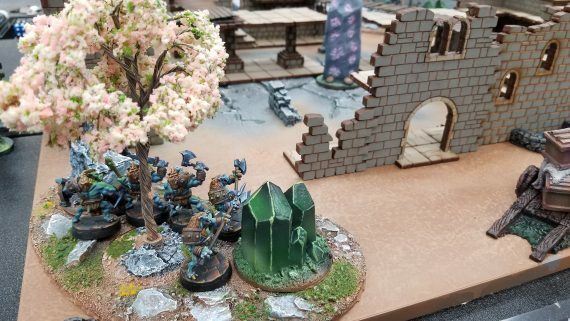 Josh ran a quick demo of Warlord's Test of Honour for me. 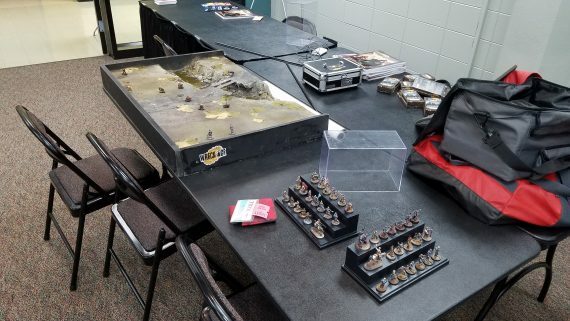 Nice to see those minis in action! 🙂 The game was quick and lethal. We skipped on some of the advanced rules and cardplay, but I definitely want to try the fleshed out version some more. 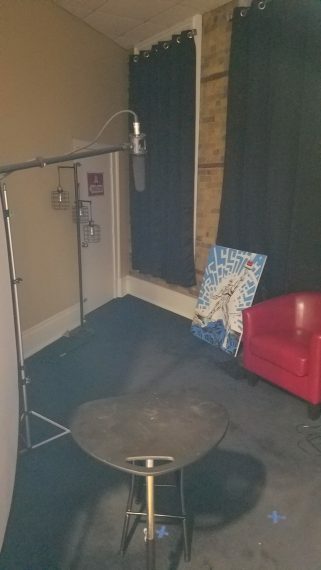 After hanging out post-events with Adam, Sam and crew, we got to see a brief tour of Adam's new studio. Sunday morning came around and Adam attempted to do a live Sunday show. Unfortunately, there were some technical difficulties so that didn't work out. 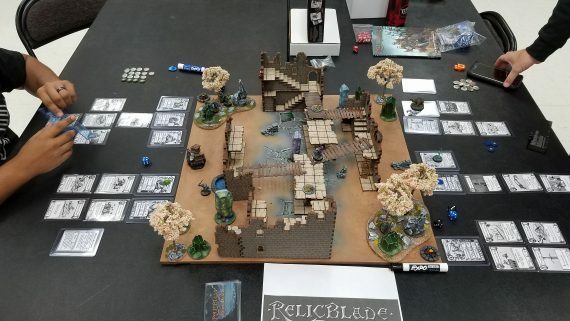 The rest of Sunday morning, I spent running RelicBlade demos. These went over extremely well as a demo experience. 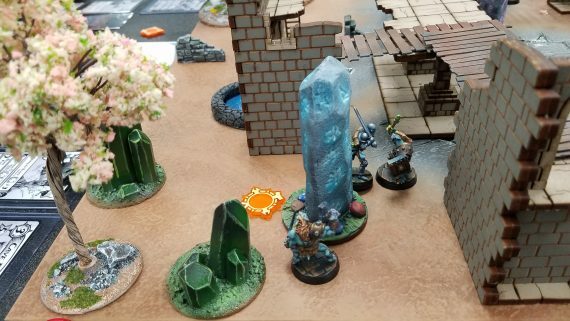 I had each side pre-set with upgrade cards, and played a Waystone scenario with a few relics thrown in for temptation. 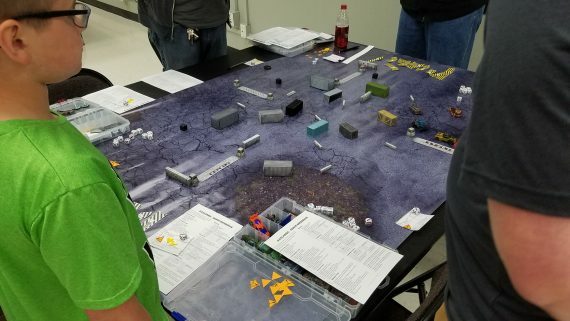 Everyone who played seemed to have a blast, and the games were all down to the wire! Quick and cinematic gameplay, great art, and easy to comprehend. For a minis fan, this was a nice little event with a good amount of variety, even with a smaller crowd. It was great hanging out with a few vendors and gamers, some who traveled quite the way to visit and support Adam and his passions. Thanks for participating to all those who attended, and with due luck, hopefully I can make it next year with some more demo options. Thanks for sharing your impressions! Very cool event. May I ask, where was TMX held? What was the entrance fee? Thank you. TMX is held on the University of Wisconsin campus in Osh Kosh, and cost 12 bucks for the weekend!